A tidal energy resource assessment was performed for a potential long term tidal energy conversion installation on the Memorial Bridge in Portsmouth New Hampshire in the Piscataqua River. The purpose of the assessment was to select and size a turbine for the location, determine the feasibility of and size a battery bank and to quantify the amount of available kinetic energy in the water that could be converted into electrical energy. The assessment primarily used data collected by one bottom deployed acoustic Doppler current profiler (ADCP) survey (HG-14) performed near the planned deployment site to characterize the currents at the site. The data from an additional bottom mounted ADCP survey (K-07) and vessel mounted ADCP transects were used to provide additional information about the currents nearby the site. “Figure 1 – Current speed and direction for the HG-14 (left) and K-07 (right) ADCP surveys. 0 degrees corresponds to true North and the radial increments show speed in m/s. The HG-14 data is from the two consecutive 29.5 day periods from 19 Dec. 2013 to 16 Feb. 2014 and is taken from a bin 12.06m above the seafloor as this was the highest available bin. The K-07 data is for the entire 35 day survey and is taken from a bin 12.11m above the seafloor for comparison with the HG-14 data. Based on the tidal current data collected during the ADCP survey closest to the deployment and average estimated power requirements current data, a turbine and rotor size were selected. A systems model was used to simulate a battery bank, tidal generator, and a power load. Using this model, utilization factors for various battery-rotor-load configurations were compared to the available tidal energy during the survey period. An annual energy production estimate (AEP) was made based off a commercially available tidal turbine’s power curve and the ADCP survey results. Figure 2 – Surface currents for maximum ebb (left) and flood (right) currents. The positions of the HG-14 (red circle) and K-07 (red triangle) stationary upward facing ADCP deployments as well as the L-17 flood and ebb transect lines are indicated. 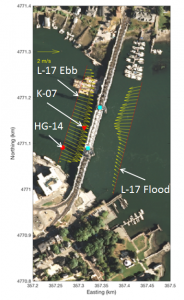 The L-17 Ebb transect intentionally intercepted the HG-14 ADCP deployment location. Approximate bridge pier locations are indicated by blue squares. Lines perpendicular to the transect lines that intercept the bridge pier locations were used to indicate the bridge pier locations in Figure 3. A crossflow vertical axis turbine with a 3mx2m rotor was selected for this site. It was estimated that this turbine would produce approximately 2kW of power on average, and 10kW at peak. The turbine is estimated to produce 13,008kWh per year of electrical energy which is enough energy for approximately 2 US homes. Figure 3 – Velocity magnitude maxima for ebb tides at the Memorial Bridge along transect lines shown in Figure 1. The circle represents the approximate location of the HG-14 ADCP deployment while the triangle represents the approximate location of the K-07 ADCP deployment. The approximate locations of Pier 2 (Portsmouth side) and Pier 2 (Kittery) are indicated with dashed lines. 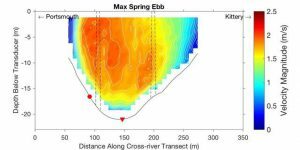 The data for this survey is an average of the tidal currents recorded over a 24 minute period centered at 12:52 GMT 1 May 2017 for the ebb survey. The raw bin sizes for this survey are 0.5m in the vertical direction. Every two bins in the vertical were averaged to produce these plots. This work is in preparation for a journal paper by authors Ian Gagnon, Martin Wosnik, Thomas Lippmann, Ken Baldwin, and Erin Bell to be published in the International Journal of Marine Energy.